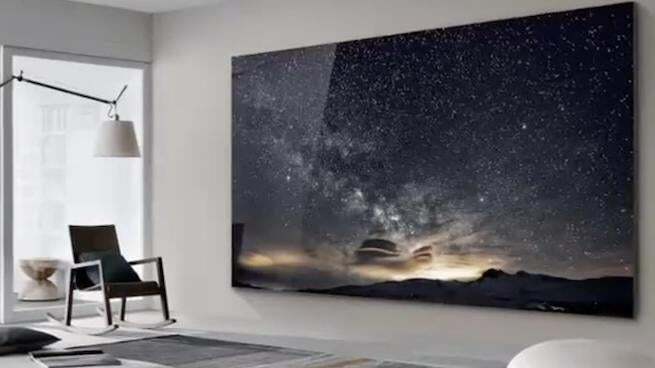 The chatter around CES 2019 this year is that alongside LG, Samsung stole the show, and with this new absolutely massive TV, it's not very surprising people think this. During the Consumer Electronics Show in Las Vegas, Nevada, Samsung unveiled a television set it's calling "The Wall," and for good reason. The behemoth MicroLED television measures at 219 inches. Or In other words, 18 feet. And here's the real kicker: it apparently creates a brighter image while using less energy than current and standard televisions. Now, if you think 18 feet is a little too big, there will be a smaller version made available that comes in at 75 inches, which is still very large, but more in-line with current televisions. And apparently it can be made larger by snapping together additional screens. Additional details are currently scarce, but we should expect to hear more about the new product soon. Of course, if you play games, you'll know a 219-inch television won't be very practical for the hobby. In fact, large televisions in general aren't great for gaming, especially competitive gaming. The bigger the TV, the farther you have to sit back, otherwise you'll be sacrificing valuable information on screen. And that's why competitive gaming is on smaller monitors. For example, if you're playing FIFA 19 on a 50 inch monitor, you're going to have to sit farther away in order to properly register everything that's going on the screen. In fact, sitting too close to a larger screen will often give players headaches or make them feel nauseous. Personally, I've found 40-45 inches to be the sweet spot in terms of bang for your buck in resolution gains, but also comfortable to play on from a variety of distances. That said, I can't imagine gaming on a 219 inch screen, unless it's a very slow moving experience. Anything else is likely to be difficult to render. But who knows, televisions only keep getting bigger, so maybe gamers will adapt as they go. However, I suspect "The Wall" won't be consumer-friendly in price anytime soon, if ever, so I don't think many of us will need to think about it too much.